Even though it’s not as nearly well-known as Milwaukee or DeWalt, G&J Hall Tools is a company that produces quality power tools. They’re mostly known for their REVO magnetic drilling systems, which are compact, efficient, and cost-effective. We’ll be taking a look at one model from this series – the REVO Low Profile 35. As the name suggests, the main selling point of this device is its low profile. This slim design allows the user to use the REVO 35 in tight and confined spaces – these kinds of situations are sometimes unavoidable. However, that’s not the only good thing about this magnetic drill press. The unit also has an efficient motor, an easy-to-operate design, and a couple of other convenient features. Is it worth the money? To find an answer to that question, let’s take a closer look at the characteristics of this machine. The REVO Low Profile 35, manufactured by G&J Hall, has an 1100 watts motor that can achieve the maximum no-load speed of 650 RPM. When we combine this with the unit’s compact size, we get a magnetic drill that’s an ideal choice for those who have to frequently drill steel in tight spaces. The 3365 pounds of magnetic adhesion allows the unit to stay secure in place while you’re working, while the 1-3/8″ of cutting capacity enable drilling through thick metal workpieces. As stated above, one of the best things about this drill 35 is its compact size. With the dimensions of 8″ x 4″ x 11″ and the meager weight of only 22 pounds, you’ll be able to fit this magnetic drill into even the tightest places. This small size also makes the unit highly portable, especially when we take its fold-flat carrying handle into account. The unit is operated via the easy-to-access control panel and the reversible stroke handle. 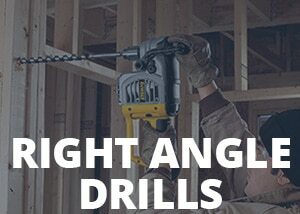 The stroke handle can be detached and mounted on the other side of the drill, which comes in very handy while working in confined spaces. The integrated LED light, on the other hand, will illuminate the workpiece while drilling in the dimly-lit areas. The 1100 watts engine of this device reaches the maximum speed of 650 RPM, allowing you to drill through the still like a knife through hot butter. The motor is very reliable and allows various applications, while the magnetic adhesion of 3365 pounds renders the device safe and secure once it’s attached to the workpiece. The unit’s quick release arbor, on the other hand, allows quick cutter changes and increases one’s productivity. It accepts a wide array of cutters, such as the threading taps, annular cutters, and the twist drill bits. The 1-3/8″ cutting capacity is the same as that of the company’s REVO R322 model, but unlike that model, the REVO Low Profile 35 can fit into tight spaces. This little magnetic drill has a lot of good things going for it. As we already mentioned, the best thing about is its compact size – the height of 8 inches and the weight of only 22 pounds enables one to use this device in confined spaces. And no matter where you put this drill at, it will stay in place thanks to the strong magnetic holding force of 3365 pounds. Another thing we really liked about it is the quick-release arbor that accepts a broad spectrum of drill bits. The crank lever also deserves some praise, as it can be mounted on both sides of the machine, while the unit’s built-in LED light removes the difficulties that come with working in dark areas. Due to the unit’s easy-to-access controls, operating this model is exceptionally easy, making it a suitable choice for those who never owned a magnetic drill before. Even though this unit is sufficiently powerful for the most steel-drilling tasks, we have to admit that it’s not the most efficient magnetic drill we’ve seen so far. The flagship models of Milwaukee and DeWalt easily outperform this device, but they also cost a lot more. Another thing we disliked is the lack of any accessories. A magnetic drill in this price category should at least come with a carrying case – this one doesn’t. All you’ll receive is the bare tool and some paperwork, which is pretty disappointing. Even though this model certainly isn’t the most efficient magnetic drill out there, the users are generally quite pleased with it. Those who bought it are praising the unit’s small size, as it allows them to complete tasks where their previous magnetic drills didn’t let them do so. One thing the users particularly liked is the strong magnetic adhesion. They claim that the unit doesn’t move at all once it’s attached to the workpiece and that its stability allows them to work without fear of accidents. In our opinion, the G&J Hall Tools REVO Low Profile 35 is absolutely worth the money, especially if you have to deal with drilling in tight areas on a daily basis. This unit is an excellent choice for a number of applications, including in-house fabrication shop work, beam work, bridge work, external fabrication site work, truck chassis work, and for the general use in confined spaces. Even though it’s not as great as some other models we’ve reviewed, the REVO Low Profile 35 is a great deal for the money and certainly deserves our sincere recommendation.